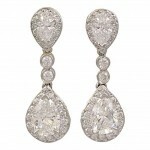 These are a gorgeous, handcrafted, pair of diamond and platinum earrings. The four pear shape diamonds have a total weight of 1.12cts, and the round brilliant cut diamonds have a total weight of 0.37cts. Designed and signed by Michael Beaudry.